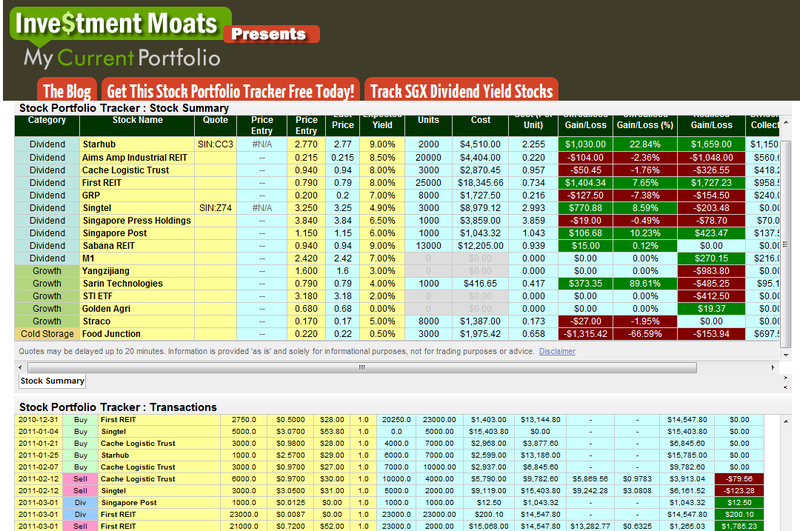 I set about creating a way to track my own dividend stocks and the response from users have been fantastic. I think that more can benefit from knowing this and know that I will look into ways to improve upon it. Here are some of the reasons why I think you should give it a try. 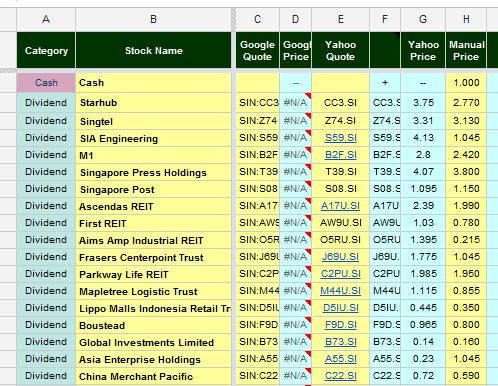 Unlike Microsoft Excel, or another paid app, this stock portfolio tracker makes use of Google Spreadsheet. All you require is a Google Account. Your stock prices gets pulled from Google Finance or Yahoo Finance. The response from Google Finance is faster, while there is a 20 min delay for Yahoo Finance. This means that you do not have to always key in the latest stock prices! Most stock tracking software are catered more to a US market or a Niche country. Yahoo Finance provides stock prices for many international markets. If you are able to find the quote on Yahoo Finance you could probably monitor it. This application is not so much for the traders (though you guys can modify it to your liking) but for long term investors who wants to monitor their stocks through a long period and see their returns and losses at a glance. For long term investors, you will have many buys and sells, and you will have a lot of dividends, the occasional stock splits. Wouldn’t it be great if the application tracks by transactions? This application does. This application enables you to enter buys, sells, dividends, stock splits, rights issues, bonus shares, dividend reinvestments. One problem with coming out with your own spreadsheet is you need to figure out how to calculate if you sell 3000 out of 10000 shares what is your average cost. This spreadsheet does that. 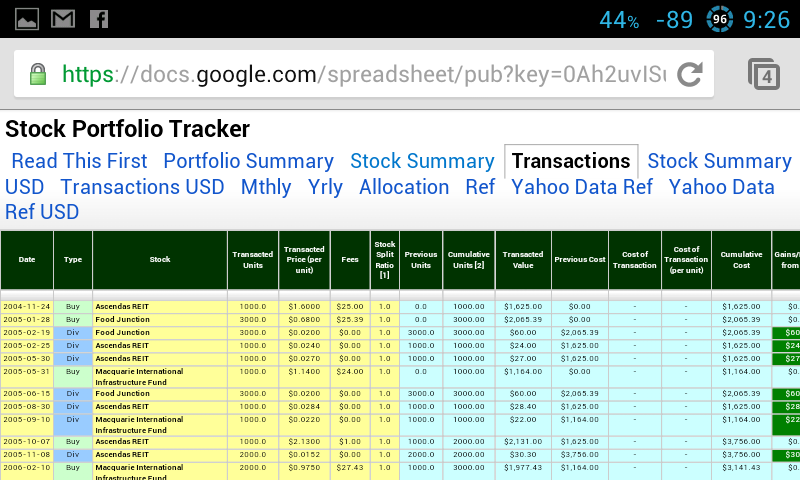 The Stock Summary section aggregates the transactions to their stocks. You will be able to see your unrealized gains/losses, realized gains/losses, how much dividends are collected, your current cost on units, current cost and market value. 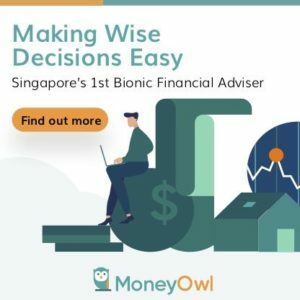 For dividend investors, you may be interested to know what is your average yield on the shares you owned and what is the current yield should you buy it today. 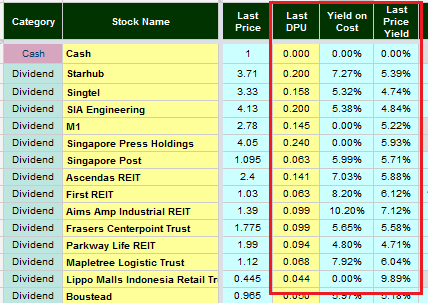 Dividend per share prices are not automatic, but you can grab them off other information portal and input them here. 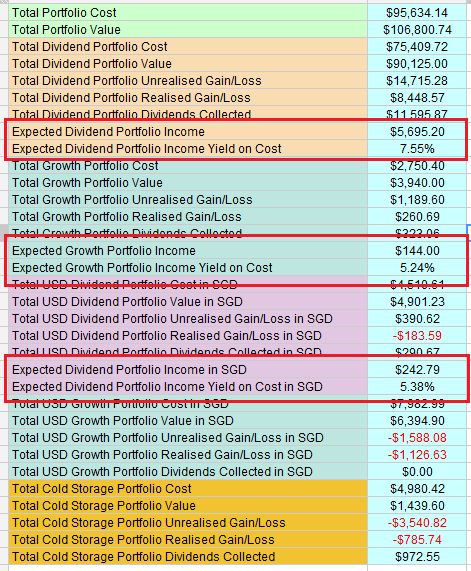 Set up well and you can see at a glance your forecasted dividend returns based on your total yield on cost. You can review your returns by year or by month. Edit it with your spouse, business partner, friends or followers! 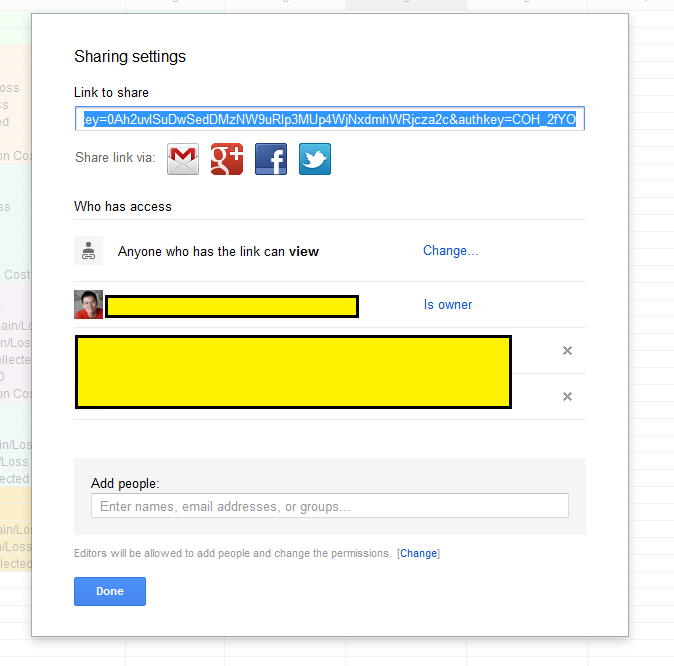 As this is a Google Spreadsheet you can have your spouse and yourself maintain one single portfolio. The same can be done with business partners as well. You can set whether they are able to view or edit. 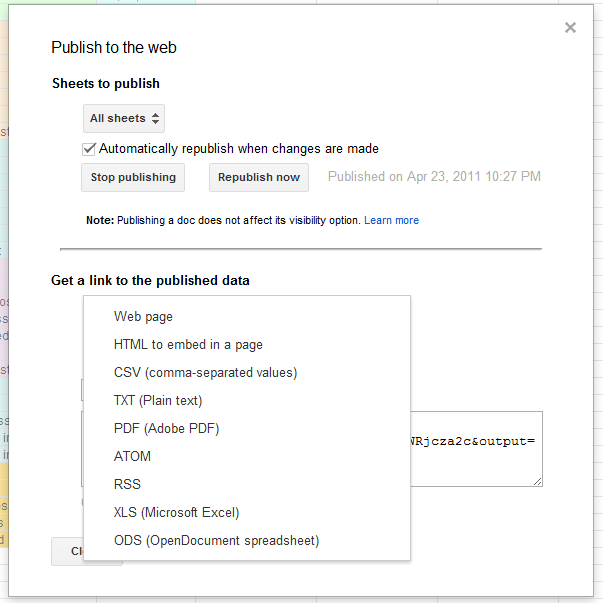 Publish your stock records in different ways! View it on your phone! Because you can publish it as a site, you can always quickly view your portfolio at a glance. This stock portfolio tracker can be copied from the original copy. I will be looking into how to improve it. Users have given me many suggestions. Some of them doable and others are beyond my powers. Hopefully folks find this useful. Do up vote this page by Like or Google Plus it. Awesome – I just donated into tip jar! What about making a similar sheet for bond investments? hi Viki Saigal! thank you so much. What do you think we should track for bond investments? because to me it is the same. You can just make a copy of Stock Summary and change it to Bond Summary and Bond Transactions. Manually update the price if its not listed. Transactions will go into Bond Transactions. Or you can put it together under stock summary. Thank you very much for this wonderful tool. It makes portfolio tracking much easier. One add-on for me to use it would be adding account reference in the spreadsheet, so we can tell transaction happened in which account. It will introduce complexity like same stock symbol in different accounts, stocks transferred between accounts etc. hi zbs, thanks. I understand what you need. but i fear if i do this it will make the spreadsheet more complex. Sometimes i wish i got the time to develop a full scale web app for users haha. i know this as i hold stocks belonging to two accounts. This is by far one of the best sheets I have seen. I actually am lucky enough to have access to Bloomberg and run a portfolio in there, but the only major difference I would say would be the ability to track/decompose PnL of FX within a non-USD trade. To also see rolling PnL (for day, week, month, year etc) also really useful. Kyith, Google Finance no longer support stock codes. if you look at my hong kong and US sheets, you will notice the stock quotes from google does work. it is just that they stop supporting Singapore SGX. hope that helps. 1. Do you treat dividends received as INCOME or as a reduction in the cost of investments? 2. If I have 10,000 shares at $10 per share each, and I sell 5,000 shares at $20, do you reduce the cost of the investment to zero (cost 10,000 shares x$10 – 5,000 shares x $20) or do you report the apportioned profit of the 5,000 shares sold and keep the average cost intact? Thank you so much, depending on the logic, the results will be different, sir. 2) the average cost is 10/10000. the cost is not reduced.